Roar!!! Yes, we all remember the dinosaurs and what better way to bring back those childhood memories than to hire our stunning dinosaurs castle for your child’s next party. Measuring 12.5ft x 15.5ft, but you will have to count on a minimum of 3 feet at the rear, and the front end of the castle, plus an additional 1.5ft from both sides, for a safe space to place it. Don’t forget that overhanging trees could be an issue so feel free to give us a call prior to booking or send us a photo. At just £50, the price includes delivery, set up, inflation and collection as well as all the necessary equipment to make it a fun day. Just give us a call or send us an email, or even use our contact form. Of course, for delivery at home, do make sure to remove all the garden items such as patio furniture, swing sets and the like, so we can set up everything without unnecessary delay. 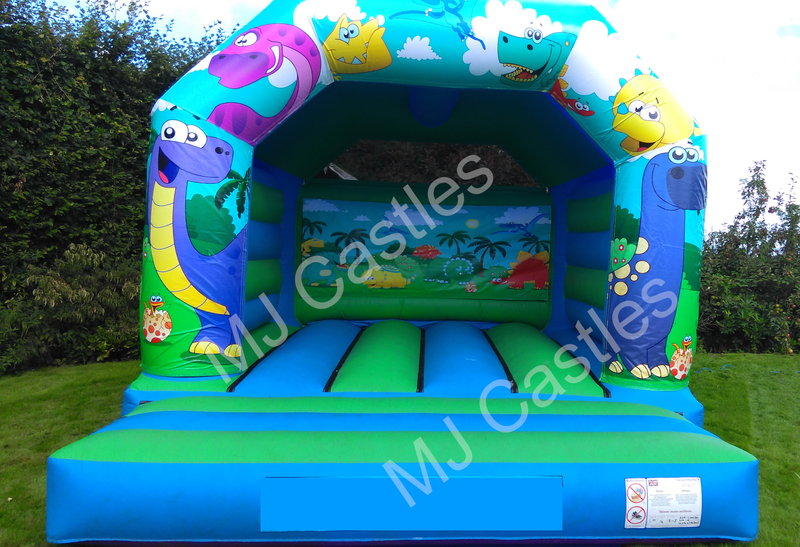 If you throw a party with a dinosaurs bouncy castle as a surprise, you’ll be a star and all your guests will be delighted, no matter whether child or adult, there will be enough fun to go around.